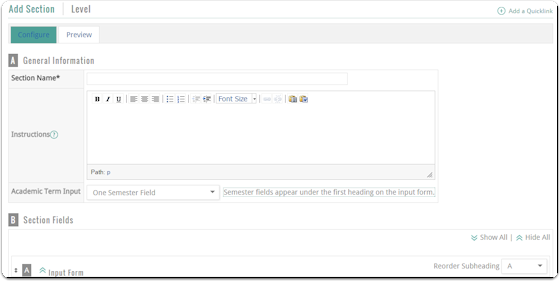 Administrators can create custom input sections for the Profile Form and Activity Input Form from within FACULTY180. Click Profile Form or Activity Input Form in the Configuration section. Select the unit for the desired form. The Form Configuration screen displays. Click the Edit icon adjacent to the form that you are adding a custom input section. The Configure Form screen displays, including a list of the default sections and any custom input sections that may have already been created for the form. If a higher-level unit has selected to use specific default sections and custom input sections (if applicable), lower-level units cannot remove those sections, or make any changes to the sections (such as deleting a field). Lower-level unit administrators are able to add activity classifications to the sections and reorder the sections. Click Add Section. The Add Section screen displays. During the process of creating a custom input section, click the Preview tab to see how the new section will display in the form. Add Label to Vita Output: select the checkbox to display the field on the vita template. This field is used to define large text boxes or rich text boxes. If an input form contains multiple fields, use the Reorder Field drop-down to change the order of the fields, if desired. Fields can also be deleted using the Reorder Field drop-down. A list of activity classifications that are available for the custom input section display here. Use the drag and drop function to select the activity classifications to be used. The available section settings may differ depending on the section being configured. Disable Section Options: used to limit faculty and administrator options for the input section. 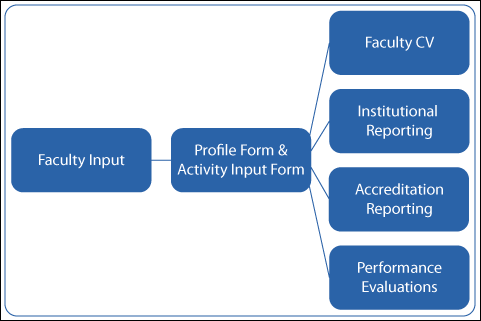 The following diagram displays how data that is input into the Profile Form and Activity Input Form provides the basis for creating multiple outputs.